Northeast Action features fast trains on the Northeast Corridor between Washington and New York, and the Empire Corridor along the Hudson River. 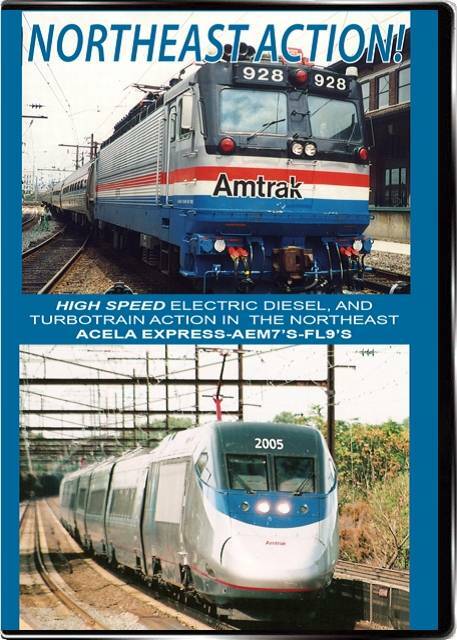 Newly updated to include high speed Amtrak Acela Express and HHP-8 electric motors. Also see AEM7's, E60's, Turbotrains, X2000, CDOT F units, NJ Transit, SEPTA, MARC, and unique FL9 cab units, now gone from Amtrak and MetroNorth. Enjoy the beautiful scenery along the Hudson line at Cold Spring and other locations, Much of the older equipment shown has now been retired. E60s have been scrapped. Digitally mastered with stereo Hi-Fi audio and limited narration. Packaged in a durable plastic library case with a printed cover. 57 minutes.